A few weeks ago I ventured into BabiesRUs. They were having a pretty big sale (unfortunately, it was pretty picked over) and I found Babyganics for BOGO free. I don't know about you, but I am a sucker for BOGO free deals. Not BOGO 50%, not Buy 2 get one free, but BOGO free (you don't see it much any more). 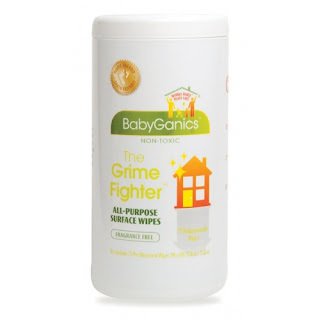 I'd never tried Babyganics products before and was looking for a wipe to clean up Sweet P's spot at the counter. I wasn't disappointed. Those are ingredients I can pronounce! The wipes work great on counter tops (kitchen or bathroom), table tops, high chairs, cribs and more. They did a good job cleaning up the food that turns to cement when it hardens (like bananas) and made me feel like the table top was really getting cleaned...without harsh chemicals. While these are fragrance free, the only negative I have is the smell. I'm not particularly fond of it, but I'd trade a not so great smell for chemicals any day!